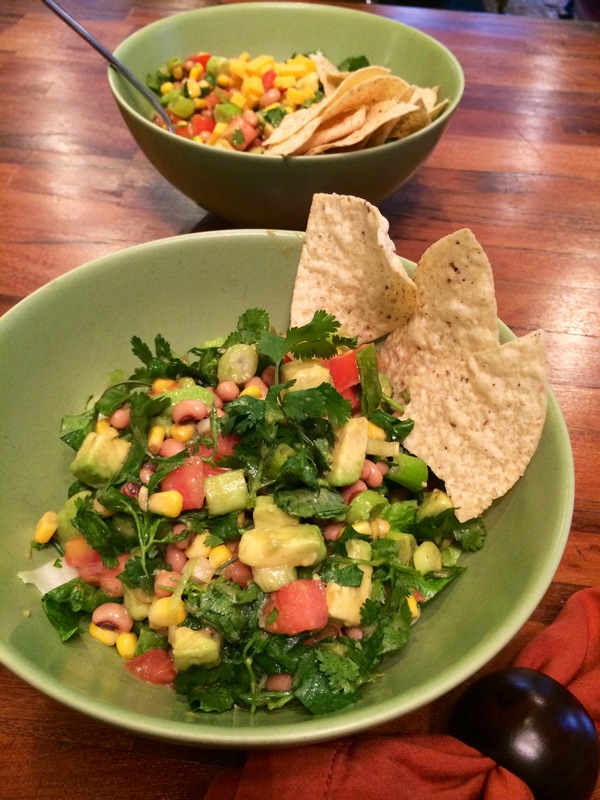 A few weeks ago I found out about Cowboy Caviar after I had made a simple bean salad that was reminiscent to someone of this recipe which they shared with me. Not only do I love the name, but I also love it’s simplicity and subtle different flavors that really make this recipe shine. The spicy base of black-eyed peas, avocado, corn and tomatoes combined with the red wine vinegar hot sauce is simply dynamite on a bed of romaine lettuce with crumbled tortilla chips on top – and it didn’t even need additional dressing. The good news is that black-eyed peas are cheap, high in protein, and low in calories, cholesterol and saturated fat. They also have a good amount of potassium and iron. If you are concerned about iron intake on a vegetarian diet, beans and dried fruit (such as raisins and apricots) will more than compensate what you don’t get from red meat. Additionally, eating foods high in vitamin C will actually increase iron absorption in the body. So enjoy this salad with a handful of dried fruit for a healthy, nutritious meal! In a large bowl, mix vinegar, hot sauce, oil, garlic, and pepper. Cut avocado into 1/2-inch cubes. Add to vinegar mixture and mix gently to coat. Drain and rinse peas and corn. Add peas, corn, onions, cilantro, and tomatoes to avocado; mix gently to coat. Add salt to taste.